A break through topic, a mentor’s example, and a good news story rolled into one. “Older Man/Younger Man” is a memoir of the relationship between a middle-aged man and a man thirty years his junior, from their first meeting, through the challenges of living together across a wide age-gap, to a climactic confession of shame and regret, the terror of loss from a life-threatening disease—and, ultimately, the triumph of love. This is a passionate, bittersweet story of a powerful love that transcends gender, bridges generations, defies convention, and brings to the partners the richness of spiritual fulfillment. The relationship between an older man and a younger man is one of the last taboos left in our culture’s sexual closet. 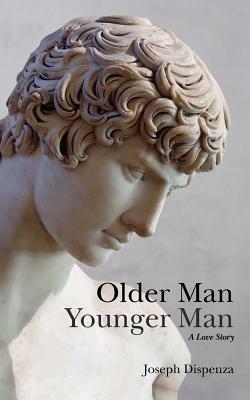 “Older Man/Younger Man” is the first book to address an inter-generational gay male relationship as a path of spiritual redemption. I grew up in a rural community of less than one thousand inhabitants, where everyone knew everyone back to their second-great grandfather, and where the first question asked was always, “What will the neighbours think?” Moreover, I too have had lovers who were decades younger than myself, and so I can relate in several ways to Joseph Dispenza’s personal memoirs in Older Man Younger Man [Sept 2011]. A personal- experience book of this nature is tricky write, for it has to straddle a narrow line between self indulgence and ‘author as example.’ Dispenza does this fairly well, with only a few examples of overworking certain parts with personal detail: such as the bathroom regimen preceding the detection of prostate cancer. Nevertheless, I can well understand how such a traumatic discovery would stand out in one’s mind. One of the aspects of Older Man Younger Man to which I could particularly relate was the first introduction of the other to parents, relatives, and/or friends. Almost invariably this is an awkward time of ‘double whammy’: Your friend/partner/lover is male, gay, and also young enough to be your son—or father, as the case may be. After this it is the ‘smirky’ looks of strangers and certain business associate until everyone gets used to it. All of these Despenza and his partner experienced, but the rather cool part is that he doesn’t dwell on them. Yes, age differentiation is a regrettable part of an older/younger relationship, but Dispenza chose to talk more about the ordinary routines of living together, and the joys and challenges that entails. While it is a fascinating story, well written, and insightful to read, it is difficult to categorize. It is a break through topic of sorts (inasmuch as there are few older-perspective, gay stories out there); it is a mentor’s example for those faced with a similar situation; and it is a good news saga because love prevails in the end. Take your pick. Four and one-half bees. It is a collection of little-known people, facts and events in Canadian history, and includes a bibliography of interesting Canadian books as well. Latest post: Benedict Arnold – A Canadian Connection.